Preheat oven to 375 degrees F (190 C) and line a standard 9x5-inch loaf pan with parchment paper (as original recipe is written // use fewer or more pans if altering batch size). Next add the melted coconut oil and almond milk and whisk to combine. Add grated zucchini (that's been squeezed of excess moisture) and stir to combine. Bake 45 minutes - 1 hour or until a toothpick comes out clean and the edges feel semi-firm to the touch. *Recipe adapted from my Chocolate Chocolate Chip Muffins. Damn, this is good! This was my first time baking a vegan cake. The only thing I will do differently is stick to flaxseed meal egg rather than chia seed egg. Great recipe! Tastes like chocolate cake- the best chocolate cake I’ve ever eaten ❤️ Thank you for the recipes! I made these into muffins, and they’re perfect ❤️ Every time I make a double batch of your bread recipes to freeze them, we still end up eating them all before they make it to the freezer. I was really looking forward to this recipe – I love your blog so much but I was disappointed in this one. It turned out really crumbly. When I let it out the pan it cracked in about 6 different pieces. Hi Rebecca, sorry to hear this didn’t turn out quite as your were expecting. It does have a slightly cake-y consistency, rather than a dense bread so it’s not implausible that it would be a little crumbly. We would recommend trying to bake a little less next time or let it rest in the pan longer after removing from oven. Hope that helps! I’m confused by your saying “2 batches” – Are you saying to double the 2 Tablespoons flax so this recipe would use 4 tablespoons flax and 10 Tbsp water? Or are you saying that the amount you put in the parenthesis is the doubled amount to use? “2 batches” is 2 Tbsp (14 g) of flaxseed meal + 5 Tbsp (75 ml) water! The amount in the parenthesis is the doubled amount to use. I made these last night as muffins and they were absolutely devine; never had any better. For flour, I used half whole wheat pastry flower, half almond flour, to get to the full required quantity. As sweetner, I doubled the maple syrup quantity; omitted the sugar. And in the batter I added shredded coconut. Oh, and the milk was coconut milk, I don’t like almond milk. My girls had it with some unsweetened coconut yogurt this morning and were thrilled. Dana, you’re the uncrowned Queen of vegan cuisine. For a few years now, I hardly make any other recipes than yours :) You rock!! 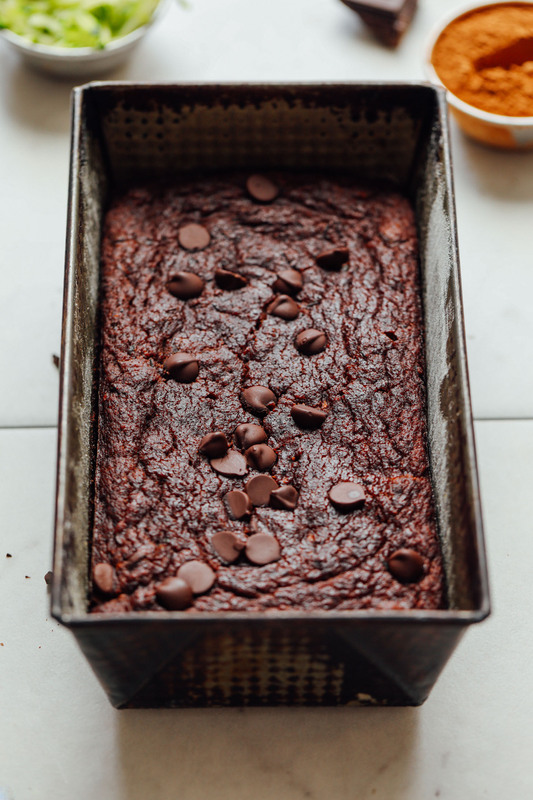 I made a non-vegan version of this with 2 eggs instead of the flax eggs…I also only had almond flour and brown rice flour so I used a mix of those instead….and I didn’t have a bread pan so I put them in cupcake cups instead, they came out great! The second time I made these I mis-measured and forgot 3/4 of the flour, and it still came out great, just a bit more moist. So these are pretty hard to screw up haha. Oh I also replaced coconut sugar with agave syrup with good results! Also I would recommend adding a dash of cinnamon, and I would not recommend leaving out the chocolate chips, this recipe is not very sweet so having the chocolate chips melt into everything add a lot! I wanted to know if I can use all purpose flour instead of the gluten-free flour blend you outlined? I want to save on the cost of the flour…. Also, can I leave out the chocolate chips? Yes, both of those recipe changes should work! I have made this recipe many, many times and my family and I have loved it every time! It’s the best recipe I have found on your blog and I will continue to make this recipe for years to come! Thank you so much for sharing it! Thanks for always helping me in the kitchen! I recently made this, following the recipe exactly. It was delicious! Moist, but not dense. Wonderful chocolate flavor. My husband loved it. It’s challenging to feed my vegan family, while keeping things GF for my celiac husband. Thank you for your fabulous recipes! Loved this! Did muffins instead of a loaf pan, cooked for 18mins at 375 (my oven runs hot) AMAZING, I want to eat every single one. I do wonder if I could drop the oil and increase the applesauce to make it even healthier… any thoughts on this? What can I use to substitute for the oat flour ? I have celiac diseases and react bad to oats/oat flour even if it says its gluten free ! Hi Ashly! Another reader subbed an equal quantity of GF flour in place of oat flour and that worked for them, so that might be worth a shot! Awesome! Recently found out that our son has many food sensitivities, and he was feeling down about missing out on all his favorite foods. This worked for him, and he loved it! Followed the recipe exactly, and it worked out great. Thank you!! Whoop! We’re glad to hear that, Beth! Sooo good! Instead of making this in a loaf pan I doubled the recipe and it made exactly 2 dozen muffins and really tasted like chocolate cupcakes- perfect for a birthday party! Smart! Thanks for sharing, Julia! Dana, I’ve made this recipe a lot and love it but I want to try something different. 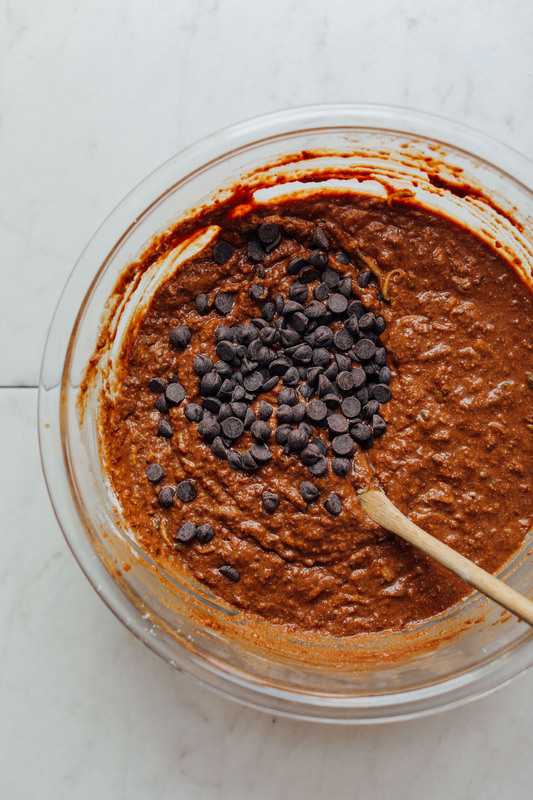 Can you tell me how to make this same recipe without the cocoa powder and the chocolate chips? I’m wondering if I have to add some other ingredient to replace the 1/2 cup of cocoa powder? Made this twice following the recipe except for substituting carob for chocolate. Today I don’t have zucchini. I know it’s a zucchini recipe but what can I use instead? Hi Kathy! Carrot perhaps? Zucchini has a much higher water content than carrots, so there would likely be a texture change after baking which you might not notice in the batter. Carrots also have a higher sugar content so you should probably take that into account. We haven’t tried this and cannot guarantee successful results but let us know if you experiment! I’m sure I’ve already commented, but I need to say that today while I made another triple batch of this delicious recipe, I pulled out the beautiful loaves and right next to where they were cooling was the melted coconut oil that I hadn’t added to the batch. (I was baking while I had not one, but three sick kids home from school- never again!) I have to say, the recipe may not even need the oil. Maybe only a teensy bit dryer than the original version but I think if you were avoiding oil this would be a great recipe! It wasn’t detected at all by my husband or my 3 kids and they were happy enough to inhale their allotted amounts before slicing, wrapping and freezing for lunches. I also didn’t have any apple sauce, so I used a tin of canned pears and blended them right there in my food processor. Maybe that had something to do with it, but seriously it was fine without the oil!? I made this last night and only got to have a slice today. It is truly an exceptional chocolate cake-and the fact that it’s vegan is a major bonus! Perfect texture and amazing chocolatey flavour. I used chia eggs instead of flax and white spelt flour instead of gf flour. Also used ground almonds (almond meal )instead of almond flour. I also subbed soft brown sugar for coconut sugar. I have a fan forced oven so reduced temp of oven to 170c. (I presume the oven temps given are for conventional ovens?) It took 55mins. Thanks Dana for yet another excellent recipe! I’m Nicola’s sister (see above) and she made this for our dessert at lunch today. My son who dislikes most vegetables scoffed two pieces before we told him it was made with zucchini! Its as beautiful as all the reviewers have said! I can’t wait to make this and other recipes from this site! Whoop! Thats a win in our books, Lynda! The chocolate zucchini bread was delicious. One bowl preparation is a bonus. I didn’t have coconut sugar or apple sauce but I substituted with cranberry juice. The mixture was still scoopable as suggested it would be. Lovely and moist and healthy! Just made this! Substituted brown sugar for coconut sugar, flax milk for almond milk and apple juice for apple sauce (1:1 for all) because that’s all I had on hand. It’s so delish! Thanks! Whoop! Thanks for sharing your recipe changes! Made this for 4th of July. The only substitution I had to make was regular flour for the gf flour blend (didn’t have anything on hand). This bread tastes like a chewy chocolate brownie. Definitely making this again. One of my favorite recipes of yours (and I make many of them and they are all delicious). What if you’re not gluten free? What flour and how much would you recommend? Thanks! Hi! Yeah! I’d suggest spelt flour at a 1:1 swap for the GF. My daughter has a nut allergy. Could I use only GF flour instead of the almond flour? You could try using extra oat flour? Let us know how it goes! This recipe was awesome. I made several substitutions, mostly was due to not having ingredients and wanting to make it anyway! My version tasted rich but not *too* rich – it tasted great alone, but also especially with peanut butter + sliced strawberries as an extra treat. Thanks for sharing your recipe changes, Jackie! We are glad you enjoyed it. This is my most recommended recipe! It’s seriously SOOOO good. 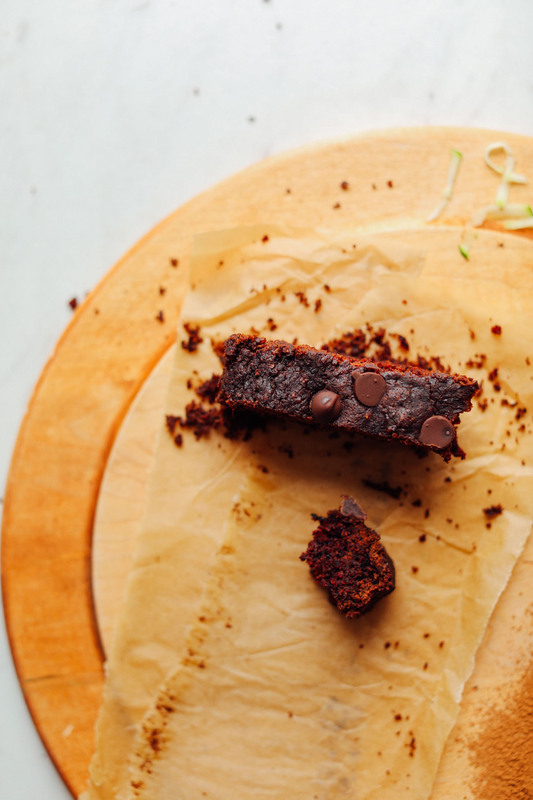 Moist and chocolately and yet you don’t feel guilty about slicing yourself an extra piece. Yummm. I made this two days in a row. Woot woot! Glad you enjoyed it, Shannon! I am on a keto diet and am really craving desserts. Just curious how you think this would turn out if I only used almond Flour? Hi Teeda! I am not sure it would work out well to just use almond flour. If you give it a try though, report back on how it goes! Good luck! Beautiful bread I have made several times. Always comes out nice. Sweet enough for a dessert, but not-so-sweet you can’t get away with considering it breakfast. Fiance says it is one of his favorite baked goods I have ever made. Yay! Thanks for sharing, Brandy! Can I make these into muffins easily? Yes! Just cook for less time! I’m allergic to apples. What would be a good applesauce sub? I used whole milk yogurt, if you’re okay with dairy! Does anyone know if I can replace the gluten free flour blend with quinoa flour, amaranth, or something similar? I made these as muffins – substituted 1/2 a ripe mashed banana for applesauce, reduced the sweetner by 1/3rd and used spelt flour. Came out absolutely delicious! Light but moist texture – great way to use up old zucchini’s. Thanks for sharing your recipe changes, Selvi! Glad you enjoyed the muffins! Can I replace gluten free flour for spelt flour? So dense and satisfying, huge hit! Best flavor and texture after complete cooling. Made this for breakfast upon my husbands request. It’s so tasty! I was out of almond flour so I substituted with more oat flour in place of the almond. It was great still. We couldn’t help but eat half the loaf already. This. Bread. Is. Amazing. I’ve made it several times, I’ve even omitted the maple syrup and it is still delicious – you don’t even miss the extra sweetness one bit! Definitely better when cooled completely as stated in the recipe. Makes a delicious breakfast or snack! 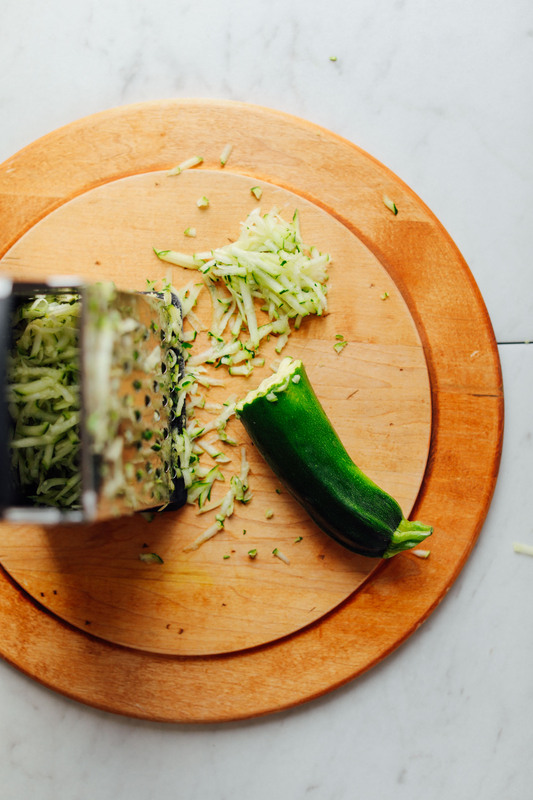 Can’t believe it’s GF and V.
– used food processor to chop zucchini finely instead of grating it, then squeezed out excess liquid with a fine strainer. Three small to medium zucchini gave me enough for the double recipe. – only half the almond milk was unsweetened as I ran out. The other half was sweetened vanilla almond milk. And it still turned out delicious! I have also made the gluten free and vegan pumpkin bread and banana bread from the site and all have been delicious. This is the first recipe I have used oat flour instead of whole oats and I think I personally prefer the chewiness of whole rolled oats and may try that next time. The loaves turned out dense and fudgy. When I poured the batter in the pans it seemed like less than the previous two recipes I have made, and while the finished loaves were not as large as the pumpkin or banana bread recipes, they still rose well. I couldn’t taste the banana or zucchini in the presence of all that delicious chocolate! I’d love to see more gluten free and vegan breads here in the future! Great recipe! I tried this recipe and everything came together very well, although it is very dense. You can’t really taste the zucchini past all the chocolate, but it was still delightful. What can i substitute the almont flr for? I omit the sugar..and its still good. Better refridgerated overnight! This looks so amazing. I have heard of zucchini bread and have seen a few recipes but I haven’t brought myself to trying it out yet. This one looks too good to resist. Thanks for sharing! My husband and I are trying to make things without flour. I do have almond meal. Is there something I can use to replace the oat flour and the gluten free flour blend? 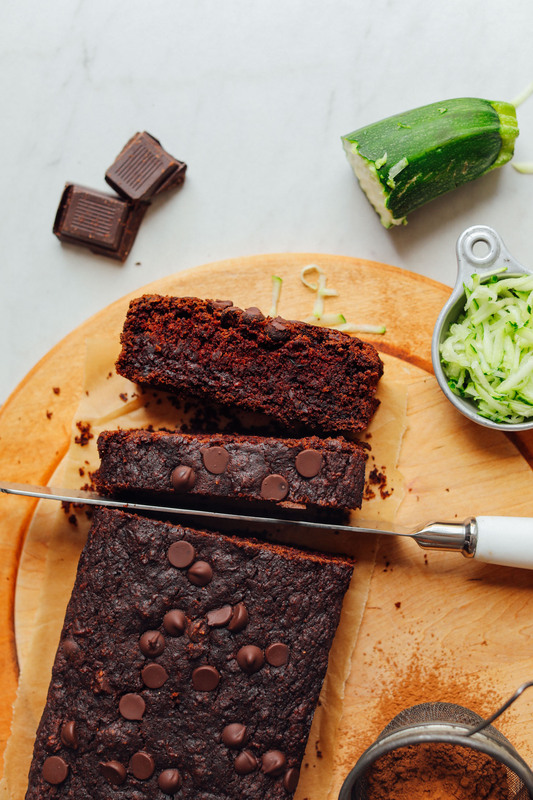 This vegan gluten free zucchini bread is TDF- to die for! Thank you Dana for creating such a glorious treat…..not sure I’m even going to share this one with the kiddos! ?? This was absolutely decadent. Ended up skipping the gf flour and just using more oat/almond mix – probably a little bit less smooth in texture but it doesn’t take away from it at all. Can’t eat apple (high FODMAP) so replaced with a little smashed banana. Never had such delicious gf/vegan (& semi guilt-free!) cake before. Amazing, amazing recipe. I did the same; omitted gf flour blend (didn’t have any on hand) and used 3/4C of oat flour and 2/3C almond flour. I baked mine for about an hour and 15 minutes and it was still gummy in the center…even after cooling. Everyone else has had such great experiences and every other recipe I’ve made of yours has been amazing so I’ll have to try it again. I have done it recently after many successes this time was on the gummy side as I tried to do it as base for tiered cake. I swapped gluten free to organic einkorn fluor and did not noticed that baking temp is aqually 190 not 180. As I have dane it many times, did not payed enough attention to details. It was clearly mu fault. I just made this today and it is delicious. Thank you, Dana, for this and all your great recipes…you’ve made going whole food plant based pretty stinkin’ easy! These recipes have changed my life. Your website has transformed my previously meat-and-dairy-oriented diet to one of vegan-and-plant-based happiness. God bless ya, you angel. Call me sometime. The cake is incredible and just sweet enough without making you feel sick afterward. I made this for the second time tonight. The first time around I tried to cut the sugar and it turned out not sweet enough, but the second time I stuck to the recipe and it came out amazing. Used almond meal instead of almond flour. This recipe looks really delicious, even from simple pictures of the ingredients used. Chocolate? Bread? Count me in, this recipe is definitely worth a try if you’re looking for a crave. I’m not much of a vegan myself, but even as a meat eater, this sure does look good. I’m failing to see how many of your recipes (whilst the photos look good) are ‘minimalist’. 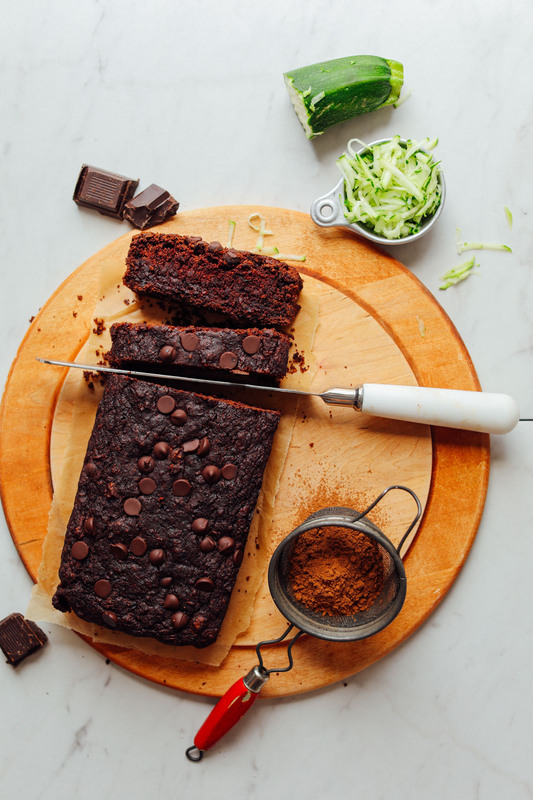 For example – 15 ingredients for the zucchini chocolate cake, 13 for the banana bread. I thought your ‘minimalist’ claim boasts ‘10 ingredients or less’. Maybe I’m missing something – please enlighten me. Hi Elle! Thank you for inquiring, all of our recipes are either 10 ingredients or less, or made in 1 bowl or 30 minutes or less. For a minimalist (the title caught my attention, as I like simple, delicious, few ingredients recipes), I thought that are way too many ingredients for the recipe. It looks awesome though :-)! Made this for my daughter-in-law and she loved it!!! If I want to use eggs would it be two eggs? Hi K! 2 eggs will work! Absolutely delicious – you are a a creative genius with the recipes you make. I have tried several of your recipes and every single one is deliciousness uncovered. I made three loaves in one day, two for friends, cannot wait to share the Chocolate Zucchini bread with them. Thank you. I made this recipe yesterday with almond meal instead of almond flour and it turned out great! Thank you for the great recipe!! I am a very inexperienced baker to say the least… so this was ambitious for me. i had my doubts because i had to bake mine for about 1 hour 10 minutes and a toothpick still didnt come out perfectly clean… but it was SO worth the wait. this is the best thing i have ever baked!!! it is unbelievably fluffy, soft, and moist. and it is scrumptious with coconut yogurt on top! I used oat and spelt at the same time reducing the amount of sugar and oil to make this and it was delicious! The bread was very rich and moist. It can definitely pass as a cake and my family loved it. I love this blog so much, it has drastically changed the way I eat for the better. Thank you Dana for these recipes, amazing content! I am a seasoned baker and my sister in law has Celiac and this was absolutely amazing! Thank you. Only thing I changed was using cane sugar. Delicious! I made this last week and it was amazing! I gave some to one of my co-workers and he could not believe it was vegan! I think the almond flour really gives it an extra kick. I doubled the recipe (ish) and made it in an 8×8 pan and did not add any sugar, just the maple syrup. I added a shredded apple to help sweeten it up. It was AMAZING!!! I am so happy with this recipe and will be making it again soon! This was incredible. I have another zucchini on standby waiting to get shredded! I used 1/3 c coconut flour instead of oat flour because I had it on hand, and WOW…what a keeper. Thank you, Dana! Love your recipes. My kids think this is the “best chocolate cake ever”. As we have no allergies, I used regular eggs, a combo of standard flour with a bit of wholemeal and a bit of spelt flour and almond meal not almond flour. Will definitely make again. Super delicious. Also froze this in slices and it thawed perfectly. Expected this kinda success; I’m thrilled to share that I’ll be preparing many times going forward! I made this last night. This came out really dry. Why? Hi Arlene! I am sorry to hear that. Did you modify the recipe at all? I followed the recipe exactly. I would like to make it again. My only guess is squeezing out the moisture from the zucchini could have caused it to become dry. Does it all get squeezed out? Hits the chocolate craving spot! I played around a bit, I didn’t have applesauce nor almond milk so I used apricot jam and coconut spread, respectively. It turned out much more moist and thick, similar to the consistency of a brownie. Just made this (it’s still kind of warm…yum). This is a terrific recipe, and I subbed the oil for aquafaba…BAM! Cut down on the fat and calories. Moist, chocolatey, and it rose like crazy! This one’s going in my rotation, for sure. Dana, you are such a kitchen (and photography) whiz and I always appreciate your recipes and photos. I wish I could attach a pic…. Did you use the same amount (1/4 cup) of aquafaba? Yes, plus another 1 Tbls. Came out perfect. I made this and OMG, it was SO MOIST with a rich, dark chocolate flavor. I followed the directions to a ‘T’ and it came out beautifully! This looks so good! I’m definitely going to have to try it, especially because I’m fairly new to veganism. I love it, though, and I’m never going back. I baked this for the first time last night and served it up at a meditation retreat today. Everyone commented how moist and not too sweet it was! I used plain flour as that’s all I had and sprinkled cacao nibs on top instead of the choc chips. Peanut butter spread was a hit too! HOW DO YOU DO IT? This is the best zucchini bread I’ve ever had, I truly don’t understand how you make vegan and gluten free things so effing delicious, but I am forever grateful for it. Thank you again! I use a spiralizer to shred a bunch of zucchini at once and I freeze it in batches. 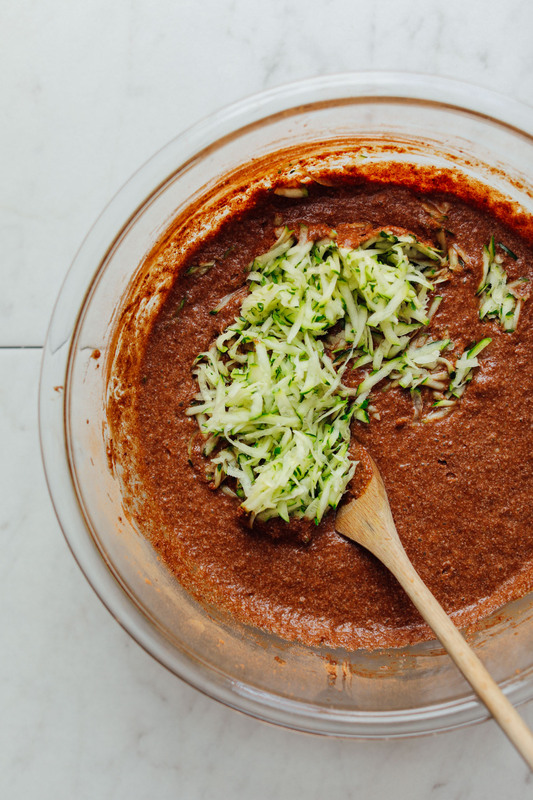 Would it be alright to use the thawed shredded zucchini? That should work, as long as it’s finely shredded and not spiralized. Made this for a group of 15 people last night (I made 2 bc one loaf wouldn’t be enough… duh) and it was a hit!! 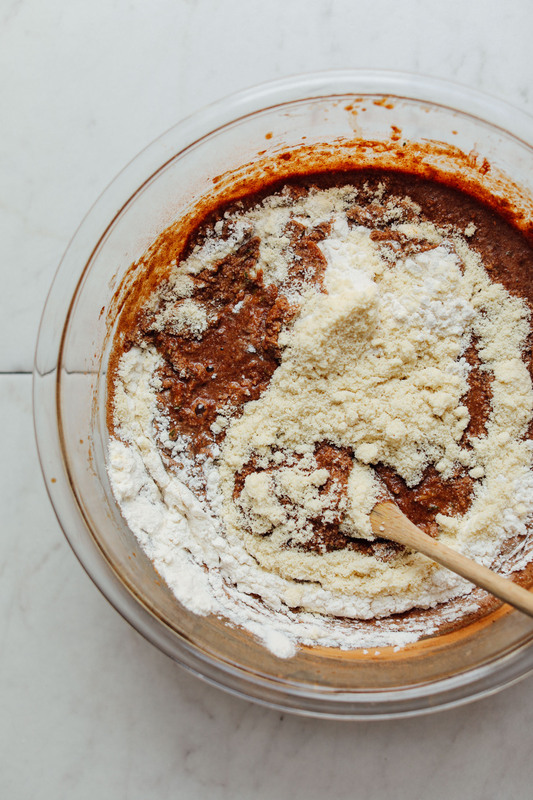 I am allergic to 6 of the top 8 allergens so these recipes you make are wonderful and I’ve learned that you can substitute a lot of things for other things and it tastes the same (i.e. I used unbleached flour only, olive oil instead of coconut and flaxmilk instead of Almond). I use a lot of these recipes to cook and bake for my friends and they don’t even notice what’s “missing”. I might even try putting a little coconut extract and top it with coconut shavings next time! Who knows? Also just a question, Dana do you come up with these recipes just from your mind? Made this and it’s delicious!!! I’m out of cocoa powder and was going to use cacao powder instead…can I use a 1:1 ratio or should I use less cacao? Thanks, can’t wait to try! This zucchini bread looks delicious. I’ve loved all your recipes that I’ve tried and can’t wait to add this one to the list. I’m always looking for ways to use up that end of summer zucchini from the garden! Replaced all three flours with an equal amount of all purpose flour and it turned out great! The only other modification I made was maple sugar for coconut sugar because I didn’t have any. Hi! Wondering if I can substitute for real eggs v.s flax eggs. Thanks!! Hi Sarah! Yes you can! Made this last night, and it came out AMAZING. I used regular white flour (I need to get some spelt flour) and trader joe’s semi sweet chocolate chips. Baking time was about an hour until I got a toothpick to come out clean. I am bringing to work today to share my vegan treat with co workers! One of my favorite recipes. Thank you so much! Delicious! So moist, and chocolately! 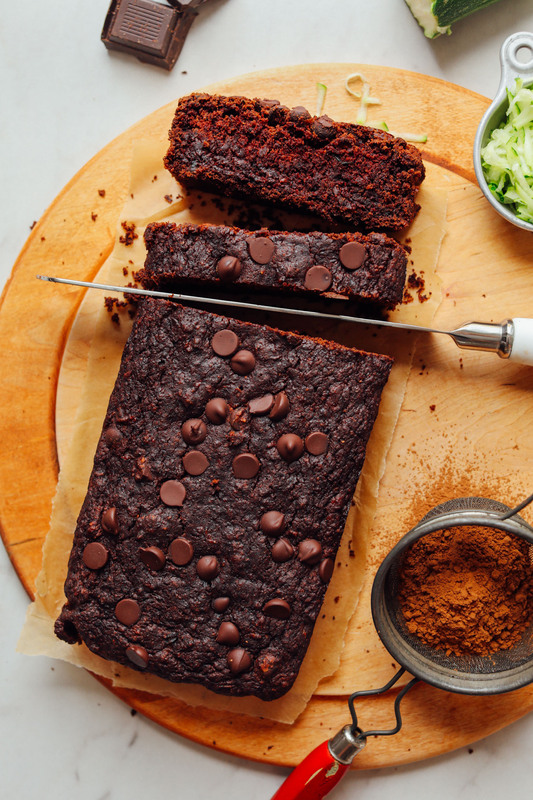 It felt more like a cake than a (zucchini) bread – which is totally fine by me, the chocolate just makes it so rich. I used almond meal (instead of flour) and all-purpose instead of gluten-free blend and let it cool over night. Oh — and I ran out of flax. I had exactly 1 tb left, so I only made 1 flax egg but, if it does make a difference… I couldn’t tell! Loved this recipe, Dana. Thank you! I’ve been trying to use my loaf pan more often and I find that I don’t have much success with breads but this was a beauty! Hi! Lots of questions, sorry in advance!! Is there any way to leave out the oil and sub it for something else? And can i sub the cocoa w carob powder? Lastly, using stevia instead of coconut sugar? All help would be greatly appreciated!! Jenny – I think you could sub the oil for more applesauce. I think you could sub cacao for carob. And yes, I think coconut sugar would work. Good luck! I have an oat allergy. What was the next best gluten-free flour combination. I have noticed you use oat flour or oats (over night oats) for breakfast, are there any substitutes that are comparable? Hi Elizabeth! I’d recommend a blend of more almond flour and GF flour. Or, if not GF, try subbing spelt. Otherwise, the blend of almond and GF should work! Ha ha Thanks Dana for this. I was just given 2 giant zuchinni today and was figuring out what to make. I think I’ll make a few of these and freeze. These look great! My husband is allergic to eggs, corn, dairy and chocolate. I finally found a chocolate he could eat without any problems “semi-sweet chocolate chips by Enjoy Life.” I spent quite a bit of time on their website researching and finally connected with an employee who emailed me a complete list of ingredients + she told me which chocolate products I should avoid! These folks are incredibly nice, helpful and thorough. Visit Enjoy Life online and talk to them. If they can help, they will & it will put your mind at ease. Hope you are successful! Christina – Unfortunately, it has been many years since I did this research and I no longer have her responses. The ingredients list she sent was only for the semi-sweet chocolate chips, not for any of their other chocolate offerings. She verbally told me which ones to avoid & I found the semi-sweet chocolate chips all I needed to create special treats for my husband. Have you thought about ordering them directly from their website (after you have a chance to research them)? I believe Amazon carries the chocolate chips also, but not completely sure. Dana’s suggestion is brilliant! I use raw cacao both in powder and nib form to make a list of items. That is a wonderful source if it works for you. The bags I have are both Sunfood Super Foods and they are in the raw organic form. Try their website: sunfood.com and their phone number 888-729-3663. Keeping my fingers crossed for you. Ramona – can you just try using cacao nibs? I’d recommend AP or spelt for the GF in a 1:1 swap ratio. As for egg replacers, I can’t comment on if those would work! Never tried them. Good luck! I would be interested in knowing that because I can’t have flax, let us know how it works. You could try aquafaba – the liquid that comes out of a can of chickpeas. Can you eat eggs? I always just make this with eggs instead of flax. Yes 2 eggs worked for me! MY daughter an allergic to nuts so I’m going to use extra oat flour… hopefully that works! ?? Can I also use plain flour? Not gluten free and all those are quite hard to get hold of…do I need to use less? Yeah! I’d suggest spelt flour at a 1:1 swap for the GF. Hi!! Just wondering if I can use regular eggs instead of flax eggs, since I’m not plant based? Hi Mitra! Yes you can! I might of just seen this recipe pop up in my IG feed and started making it STAT! It’s just out of the oven and I couldn’t’ resist a piece, it is DELICOUS! So moist and chocolatey, another great recipe! Followed the recipe exact except used date sugar instead of coconut. FYI – It only took 40 minutes to cook for me. All I have to say is “YAAAASSSSSSS.” Can’t wait to make! This looks fab!! Do you think I could pour the batter into muffin tins and make muffins with it, or would it require additional substitutions? Thanks! Hi Hanusia! That should work, I would just adjust the baking time (less time)! Yes, I would love to know the same! I’m not GF and would want to make with regular all purpose flour if possible. I’ve tried the other zucchini bread recipe from this site with regular flour, and it worked great for me! I even did half AP and half whole wheat flour and it still turned out delicious! yeah! A regular flour should work, such as spelt! Yes, I use regular flour in place of the gf flour and it turned out wonderful! I replaced all of the flours with all-purpose flour, and it came out amazing! Im about to make it again! This was my question! Thanks! I have a nice big zucchini from my garden and cannot wait to use it for this recipe! Can I sub something for the almond flour since I don’t have any on hand? Maybe all purpose or wheat flour since I don’t really have to worry about GF? I do have Bob’s GF flour. Thanks! Hi Emmarie! You can replace it with all purpose flour! Love all of your recipes that I have tried so far! This one looks like a keeper – but I can’t have potatoes. Any way to sub arrowroot or cornstarch for the potato starch? Hi Christina! Either would work! I have the same question! I’m allergic to pats and need a substitute for it. I did exactly this yesterday, and it came out PERFECT! I know this question is a month old, so you’ve probably found your own answer by now anyway, but I was really happy with the results. Yum yum!!!!! Love hiding zucchini because it’s so easy to desguise! Can’t wait to try this! My daughter is gf but hates chocolate, crazy huh?! I’m assuming I could just leave out the cocoa powder and chocolate chips and it would be just like regular zucchini bread?, which she loves!! I’ve done this once before. If you leave out the chocolate I recommend using a bit of cinnamon (I can’t remember how much I used) in it’s place for flavor. Otherwise you might feel like it’s missing something.